Now there are 3 double hundred scores in ODI and all of them were made by Indians – Virender Sehwag, Sachin Tendulkar and Rohit Sharma – yet the one innings at Turnbridge Wells on June 18th 1983 would remain possibly the best – that was Kapil Dev’s 175 not out – coming in as he did at 17 for 5 – and that was against Zimbabwe, who defeated mighty Australia in that WC. Zimbabwe with Harare as Capital, is a landlocked country located in southern Africa, bordered by South Africa, Botswana, Zambia and Mozambique. Robert Gabriel Mugabe has been its President for decades now. In Jan 2013, the Vice-President John Nkomo died at the age of 78. A new constitution approved in the Zimbabwean constitutional referendum, 2013 curtails presidential powers and will lead to an election to decide whether Robert Mugabe extends his three-decade rule. Our own India was under the rule of British and the colonial vestige continued for long……………… till 2001 when Yashwant Sinha presented the budget – a little tradition was followed. The presentation itself is an elaborate ceremony – till 2001 it was presented at 5 pm - a practice from the Raj era, when the British and Indian budgets were presented simultaneously, around noon in London and in the evening in New Delhi. A couple of years back, there was news that leather shoes in schools were banned as it was seen as 'vestige of colonial rule' ~ instead canvas plimsolls replaced uncomfortable and "environmentally hazardous" leather shoes. It followed a campaign by Maneka Gandhi, on animal slaughter. In every city – you would have streets named after colonial rulers – many of whom there may not be special attributes at all and some had infact acted against the interests of the Nation. Zambezi is the fourth-longest river in Africa, and the largest flowing into the Indian Ocean from Africa. The area of its basin is 1,390,000 square kilometres (540,000 sq mi), slightly less than half that of the Nile. The 2,574-kilometre-long river (1,599 mi) rises in Zambia and flows through eastern Angola, along the eastern border of Namibia and the northern border of Botswana, then along the border between Zambia and Zimbabwe to Mozambique, where it crosses that country to empty into the Indian Ocean. The Zambezi's most noted feature is Victoria Falls. Other notable falls include the Chavuma Falls at the border between Zambia and Angola, and Ngonye Falls, near Sioma in Western Zambia. After traveling 1,000 miles from the north, the Zambezi River reaches the edge of one world and plummets 350 feet into another. Victoria Falls, between the borders of Zambia and Zimbabwe, is over a mile wide. No other waterfall in the world can match her scale. The Zambezi is known as the “River of Life” across southern Africa, but surviving by the river near Victoria Falls is not always easy. During the rainy season the Zambezi has a fierceness and a power that is deadly to both animals and humans. At the peak of the rainy season, almost 300,000 gallons of water cascade over the falls every second. Despite the danger, many birds, reptiles, fish, and mammals call this area home. As is natural with Africa, predator and prey rely on the river for water, life flourishes for some… and killing field for some. David Livingstone, the Scottish missionary and explorer, is believed to have been the first European to view Victoria Falls on 16 November 1855 from what is now known as Livingstone Island, one of two land masses in the middle of the river, immediately upstream from the falls on the Zambian side. He named it after Queen Victoria. Victoria Falls is known as the greatest curtain of falling water in the world. Columns of spray can be seen from miles away as and at the height of the rainy season, more than five hundred million cubic meters of water per minute plummet over the edge of Victoria Falls, over a width of nearly two kilometers, into a gorge over one hundred meters below. The wide, basalt cliff over which the falls thunder, transforms the Zambezi from a placid river into a ferocious torrent cutting through a series of dramatic gorges. It is in news as Mugabe orders Victoria Falls to be renamed 'the smoke that thunders' to get rid of its colonial history ~ for the president of Zimbabwe Robert Mugabe believes Victoria Falls does not reflect its liberation heritage. He wants it to be renamed the waterfalls which is one of the seven wonders of the World as 'the smoke that thunders' to get rid of its colonial history. Locals already refer to the landmark as Mosi Oa Tunya - which means 'the smoke that thunders'. The ruling party, Zanu PF, said the government would be instructed to get rid of all colonial names for towns and schools. The local government minister is quoted as stating: 'Institutions bearing colonial names must be changed and be given indigenous names... school syllabuses in schools must also change. 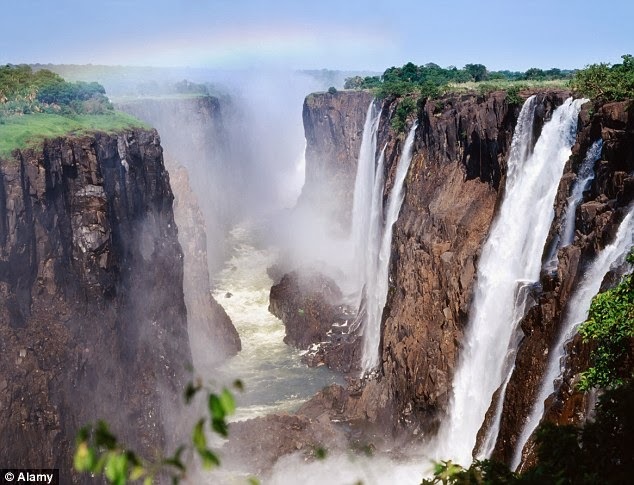 The vocal opponents say that David Livingstone was not the first person to see the Victoria Falls, it had existed before and it (the falls) must be rebranded Mosi Oa Tunya. In Zimbabwe too, a number of institutions and roads still have their colonial names, which is being opposed now.